Understanding Bunny Lines: Is Botox the Problem or the Solution? Do I have bunny lines? Bunny lines are the fine wrinkles that appear when you scrunch up your nose, such as when you laugh or smile deeply. While bunny lines can simply be caused by aging, they can also be a telltale sign that you’ve had Botox. In either case, the underlying cause is the same: the overuse of certain facial muscles. This cosmetic buzz word might sound adorable — after all, who doesn’t love bunnies? — but it’s just another type of wrinkle to worry about. Like the dreaded crow’s feet, bunny lines show up when you make certain facial expressions. These lines appear straight or somewhat diagonally on either side of the nose just beneath the bridge, and as you age, they eventually hang around in the form of fine lines even when your face is relaxed. Bunny lines can also be indicators that you’ve gotten Botox. In fact, celebrity watchers have been scrutinizing the bunny lines on such celebrities as Nicole Kidman, Kim Cattrall, Kylie Minogue, and Madonna for exactly that reason. We reached out to Dr. Jennifer D. Holman, a board-certified dermatologist at the Center for Aesthetic and Laser Medicine in Tyler, TX, and Dr. Jean-Paul Azzi, a facial plastic surgeon and owner of The Palm Beach Center for Facial Plastic & Laser Surgery in Palm City, FL, for their input on how these lines form and how they can be treated. If bunny lines haven’t been on your radar thus far, you might be unsure if you even have them. There’s a simple test to determine whether you do. Look in the mirror and scrunch up your nose like you’re smelling something awful. See those wrinkles forming alongside your nose? They might be obvious or they might be nothing more than tiny creases. In either case, they fan out from the inside of your eye to the bridge of your nose. That’s the nasalis muscle at work, which is the same muscle that allows you to flare your nostrils. Now relax your nose and look closely. Do you still see those fine wrinkles? Those are bunny lines. On a side note, you might also see some fine lines on the top of your nose. Those aren’t exactly bunny lines, but they can be treated in a similar way. There are two main causes of bunny lines: age… and Botox. The muscles on your face contract to form expressions. When you’re young, this isn’t a huge concern. Your skin is elastic and bounces back readily. However, as you get older, your skin loses much of its elasticity. This leads to sagging skin, wrinkles, and fine lines. You’ll first notice fine expression lines in areas of the face that are overworked because of repeated facial movements. That’s why you’re always hearing about crow’s feet and frown lines. Crow’s feet, which appear on the outside of the eyes, are the result of frequent squinting. Frown lines appear between the eyebrows as a result of furrowing of the brow. Bunny lines work the same way. As you get older, the more you work that part of your face, the more likely you are to develop lines. Whether it’s aging or Botox that is causing your bunny lines, the underlying cause is the same: the overuse of certain facial muscles. Botox works by relaxing muscles in targeted areas of the face. Sometimes, when specific facial muscles are restricted, other muscles work overtime to compensate for them. For example, if you get Botox in your glabella (the area between your eyebrows), you might find the nasalis muscle kicks in when you’re frowning. When these muscles get overworked while others stay still, the resulting expression is a bit unnatural and a tell-tale sign of Botox. This is especially the case if you’ve had too much Botox over an extended period of time. If you are continually forcing the nasalis muscle into overactivity, you’ll end up with those fine lines a lot sooner. 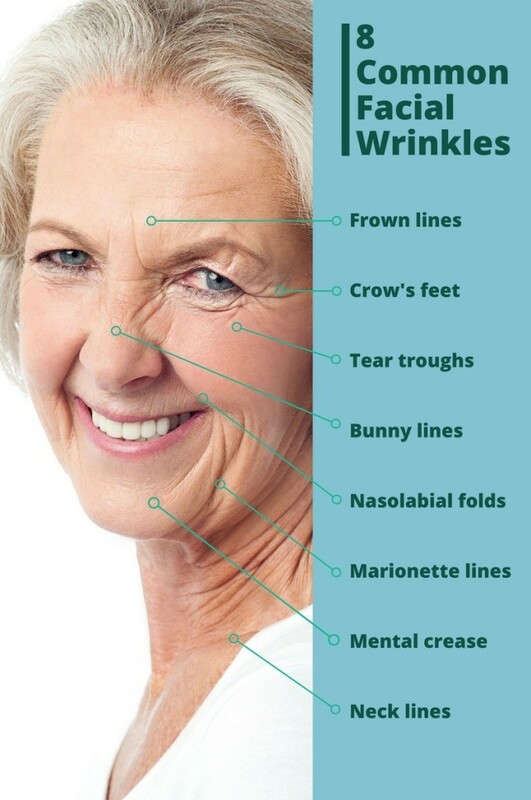 A skilled doctor can prevent the development of these lines due to Botox. Ironically, the best way to treat your bunny lines is with Botox. Only this time, the Botox is injected into either side of the nose, directly targeting the lines. As bunny lines become more and more a matter of public scrutiny, an increasing number of individuals are seeking this type of treatment. “We do it every day,” says Dr. Holman. However, this is not without risks. “If bunny lines are treated inappropriately, there can be temporary drooping of the corner of the mouth,” she warns. Dr. Azzi has had a different experience, explaining that people coming in for treatment for bunny lines is “not as common as you might think.” However, when people come in for brow treatments, he says he’ll often address bunny lines at the same time. Of course, you could also choose to cool it on the Botox, especially if repeated use is a contributing factor. Consider a wrinkle treating alternative like Dysport, which also uses the botulinum toxin type A and acts on the muscles in a similar way, with some fundamental differences. Dysport works faster and spreads over a wider area, but it doesn’t last as long and it takes more to achieve the same results. Depending on your specific situation, this may or may not be to your advantage. Bunny lines occupy a very small area, so you might not want an injection that spreads quite so much. However, the mild nature of the injection might be better, because very little of the agent is required. In any case, Dr. Azzi cautions against injectable fillers for bunny lines. “Occasionally, a patient will ask me to fill those lines or the ones between the eyes with a thin filler, such as Belotero or Restylane,” he says, “but I find it better to try a neuromodulator first.” In fact, he advises against seeing someone who recommends fillers without first trying a neuromodulator such as Botox, Dysport, or Xeomin. Maybe your smile is naturally big and frequently engages the nasalis muscle. Is there a way to prevent fine bunny lines from forming, or are you doomed to get them? Botox can only do so much against wrinkles and fine lines. Although it’s said to promote some skin elasticity by boosting the production of collagen and elastin in the skin, it primarily works on facial muscles in the manner described above. This makes it an ideal way to prevent the development of fine lines and wrinkles because it limits the depth of expression. If you’re going in to treat your frown lines and you’re concerned about overworking the nasalis muscle, Dr. Holman suggests preemptively treating the bunny lines. “It’s important to treat this area in patients who need it when treating the glabella or frown area,” she says, noting that some patients use the nasalis muscle more than others. You can also prevent or reduce bunny lines with more conventional methods like anti-aging skin products, a good moisturizing routine, and plenty of sleep. Talk to your dermatologist about your options. “We recommend a good daily skin care regimen that includes a sunscreen, antioxidant, and retinoid to help with the overall appearance of fine lines and wrinkles,” Dr. Holman says. There’s an important lesson to be learned here: our facial muscles are interconnected in very subtle ways, and you can’t stop every muscle in its tracks. You’ll have to choose which lines you care the most about, and which ones you don’t. You’ll also have to forgive yourself a few fine lines as you age. Another word of advice: if you do decide to get Botox injections for your bunny lines, make sure you find a skilled cosmetic doctor. » Ready to do something about those bunny lines? Use Zwivel’s online directory to find a qualified cosmetic doctor near you.